Rouletteâ€¦ As a game it started long-long time ago. Some say it happened accidentally, as Blaise Pascal was doing some experiments, some say that this game appeared in the Roman Empire. So, here we are. We know two versions of one story but one of them is reality and another is myth. Which one is real? Which one is fake? Maybe both of them are myths and there is another true story how everything happened. That is, actually, what happens, when people get engaged into something. They add something, they omit and then forget the story but they know it was there, so they make up a new one. That is how the myths are born. Gambling psychology is just like that. If something happened and a story took place, we need to make a grey story brighter. There are the myths you should avoid. #1. All the roulette wheels are the same. It is like telling that all hamburgers in the world taste the same. It is ridiculous to believe in that, as there are many producers, different shifts of workers, who make them. #2. Each spin of the roulette is not random. Hmm, how can you define where the ball will land next time? Many "winning" systems are based on that. If the roulette wheel is flawless, you will never guess. Well, you can guess and your bet will win, but you cannot do it all the time. To guess the number two times in a row is next to impossible. #3. The roulette strategies actually work. Actually, they do not. Why? Well, because the roulette game is a game of chance. You cannot guess, you cannot predict, you cannot know, you can simply hope. And that is all. The mathematical rules rest while the roulette wheel is spinning. #4. The more you pay the more you win. It is sad to inform you but no. 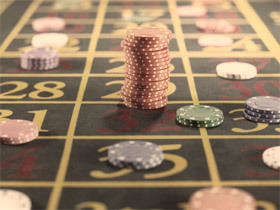 The roulette is not that kind of game, where the winners are defined according to the sum of money, which was invested. If this rule worked, it would be like this - only rich people can win, because they waste more money on the roulette. It does not happen like this. I agree that if your bet is $5 and someone else's the same bet is $5000 - there will be difference in the payoff. but it does not mean, if you were putting large sums of money in the game the game will care. Come on, be realistic. #5. The bets play no role and they do not matter. Well, they do matter. If you bet on black, you payoff will be 1/1. If you make a straight bet, your payoff will be 35/1. I suppose there is difference and a big one. Every time, when you are going to gamble, be sure that you are not in the trap of the false ideas and myths. You are a sober-minded person, who knows what to do. Play with mind and good judgment!